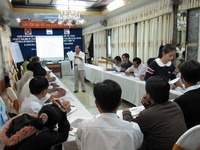 Vietnam's Central Committee for Flood and Storm Control (CCFSC) and the Asian Disaster Management Center (ADRC) organized a workshop for local government officials in Thua Thin Hue province on 25-26 March 2010. A total of thirty-five officials from the province, the CCFSC and the ADRC participated in the two-day workshop. As part of ASEAN project Capacity Building of Local Government Officials on Disaster Management, this workshop marked the third one in the country followed by those in Thien Giang and Lao Cai provinces. In this workshop, local officials took lectures including institutional and legal framework of provincial disaster risk management, early warning and Japan's experiences based on the subjects lectured in the Training of Trainers (TOT) in June 2009 where the trainers had participated. Owing to the assistance of the CCFSC and provincial officials, the trainers gave lectures in instructive and interactive manners, bringing about active discussion and fruitful feedback. ADRC hopes that the outcome of this project will be shared in other provinces and contribute to capacity development of local officials on disaster management throughout the country. Likewise the workshops for local government officials are scheduled in Brunei, Malaysia, the Philippines and Thailand in 2010.